Mark Bittman, author of How to Cook Everything, stopped by the Today Show to go over the best way to make paella. He has three different recipes for paella below but first he wanted to explain the right kind of pan you need to make any type of paella. 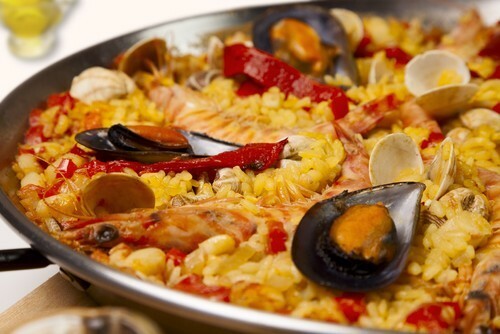 Bittman said paella is really just rice, a liquid and whatever other ingredients you want to throw in the pan. He said the only thing you need to remember is to use a pan with high edges and a large cooking surface. The high edges keep the liquid in the pan while the large surface area allows the liquid to cook quickly forming a crust on the bottom of the dish. As for the rice, Bittman said any rice will work, from white rice to brown rice to arborio rice. Mark Bittman stopped by the Today Show where he showed Matt Lauer how to make simple paella with numerous options, like seafood paella and pasta paella. Heat oven to 450 degrees. Warm the stock with the saffron in a small saucepan. Put the oil in a 12-inch ovenproof skillet over medium-high heat. When hot, add the onion, sprinkle with salt and pepper, and cook, stirring occasionally for 3 to 5 minutes. Add the rice and cook, stirring occasionally for another minute or two. Carefully add the warm stock and stir until just combined, then stir in the shrimp. Put the pan in the oven and bake for 15 minutes. Check to see if the rice is dry and just tender. If not, return the pan to the oven for 5 minutes. If the rice looks too dry at this point, but still isn’t quite done, add a small amount of stock or water. When the rice is ready, turn off the oven and let it sit for at least 5 minutes. Remove the pan from the oven and sprinkle with parsley. Put the oil in a large, deep skillet over medium-high heat. When it’s hot, add the chorizo and cook, stirring occasionally, until lightly browned. Add the onion, bell pepper and garlic and cook, stirring occasionally, until the onion turns translucent. Stir in the rice, sprinkle with salt and pepper, and cook, stirring, until the rice is glossy and completely coated with oil, just a minute or two. Add the tomato and 2 cups water. Adjust the heat so that the liquid boils steadily but not violently and cover. Cook for 30 minutes before checking for doneness; add a little water if the rice is dry but not yet tender. Cover and cook until the rice is just done and the liquid is absorbed, another 5 to 10 minutes. Stir in the peas and the clams, replace the lid, and continue cooking until the clams are open, 3 to 5 minutes. Put the oil in a large skillet over medium-high heat. When it’s hot, add the onion and garlic and cook, stirring, until they begin to soften, 3 to 5 minutes; remove from the pan with a slotted spoon. Add the noodles to the pan, sprinkle with salt and pepper, and cook, stirring constantly, until they brown. Return the onion and garlic to the pan and add the saffron, paprika, peas and bell pepper. Cook, stirring frequently, for 2 to 3 minutes more. Add the water and cook, stirring and adding more liquid if things start to stick, until the noodles are nearly tender and everything is just starting to dry out, about 15 minutes. Stir in the seafood and cook, stirring occasionally and adding a little more water or stock if you like, until it is just cooked through. Stir in the parsley and serve with the lemon wedges.